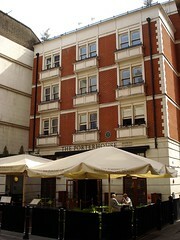 A vaguely Irish pub across three floors near Covent Garden. The pub serves its own beer (all nitrokegged) and a wide range of international bottled beers, huge numbers of which decorate the premises in cabinets mounted on the walls. The porter is drinkable enough. The main bar is down a few steps from the entrance, but there are smaller ones elsewhere. They've had Kriek on tap in the past, but the only Kriek available on Kake's November 2008 was bottled Boon Kriek (£4.50/375ml, though the beer menu claimed this should have been £4.85). On a Thursday evening in August 2008, it was packed, noisy, and quite dark; not a pleasant drinking experience at all. At least there wasn't a loud live band as well which there has been on a previous visit. Although it's a pretty large pub, by 5:30pm most of the tables were either taken or reserved, and it was pretty much standing room only half an hour later. Ewan has found the same to be the case at most of the times he's visited, and finding a table can often involve a long wait and a lot of lingering (and be careful not to block any TV screens lest you incur the wrath of sporting fans). However, it can actually be a pleasant enough place to drink if you (a) can afford the expensive bottled beers, and (b) can get here outside peak hours; 2pm-4pm on a weekday afternoon should be just about right. Food is served noon-9pm Monday to Saturday, and noon-7pm Sunday. Last visited by Ewan, Jo and others, 7 November 2009. Opening hours taken from the Porterhouse website, December 2015. Last edited 2015-12-10 10:02:57 (version 9; diff). List all versions. Page last edited 2015-12-10 10:02:57 (version 9).